Description: Uniform emblem is composed of a green knot on a khaki-tan (or kelly green, dark blue, or white) background and border. The green knot on the khaki-tan background and border is default for all members; all of the other knot emblems shown are older versions of the award. Only the khaki-tan version is available through the BSA's Supply Division. Green knot comes from green ribbon color of original medal (shown below). District/Council Scouters: Cub Scout, Boy Scout, Varsity Scout, and Venturing/Sea Scouting Roundtable/Huddle staff members. There are different requirements covering basic training, performance, tenure, and certification for each award. Scouters earning the Training Award in one program area MUST complete ALL requirements (including tenure) for subsequent training awards in other program areas. 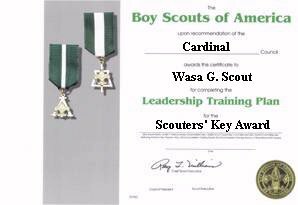 Depending on the interpretation of your Council's Volunteer Training or Leadership Development Committee, Scouters may use the tenure for the Scouters' Training Award toward the Scouters' Key Award in the same program area (for instance, tenure used for the Scouters' Training Award as an Assistant Scoutmaster may be used toward the Scouters' Key Award as a Scoutmaster). This will vary from Council to Council and not a nationally-mandated policy (source: BSA Volunteer Training booklet). More on this can be found on Leaders' Online(tm).